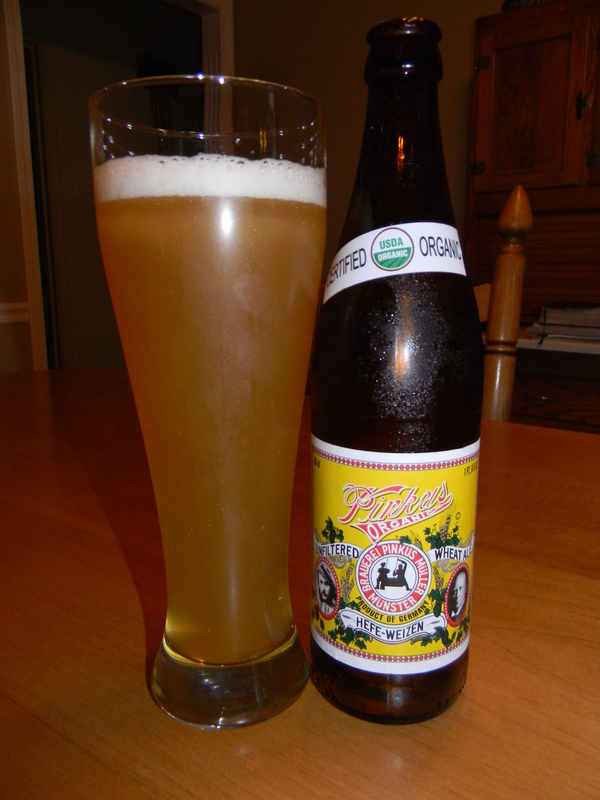 Review of Pinkus Organic Hefe-Weizen | Beer Apprentice - Craft Beer News, Reviews, Interviews and Info. Hi guys. For today’s craft beer review I’m going to be sampling the Pinkus Organic Hefe-Weizen made by the Brauerei Pinkus Mueller situated in Münster, Germany. I can’t say that I’ve had a beer from Pinkus, so this should be a treat. When I checked on the website, pinkus.de, I found this commercial description about the brew. Pinkus Hefeweizen is a refreshing beer taste. Strictly according to the German Purity Law Pinkus Hefe Weizen from 60% organic wheat malt and 40% organic malted barley, hops and premium brewing water is produced. It contains no protein stabilizing agent. Before placing the wheat beer from Munster unfermented wort is added, the can still ferment the beer in the bottle. Therefore, it is advisable Pinkus Hefe Weizen always well chilled and pour with some feeling. Much to the benefit! Alright. Let’s pour this thing. This beer came in a 16.9 oz. bottle and it had an ABV of about 5.1%. It discharged a hazy, yellow/gold color with a white, soapy head. The crown was sized well, however it dissipated a bit quick though. The lacing seemed a touch thin too. Hardly any foam was left on the sides of the glass as I worked my way down. It had a very muted nose. Buried deep I found a touch of coriander and clove spice. A tiny bit of wheat and a smidgen of banana. That’s really all I got. I was a little bit disappointed about the bouquet. I was expecting much, much more. The flavor was the more of the same. Very, very light and muted all around. All that was detected was the slightest tone of banana, wheat and spices. Hmm. The mouthfeel was thin with a watery texture. It was crisp, thirst quenching and refreshing though. It was quite flat as well and barely any flavor was left behind on the palate for me to enjoy between sips. Well, this beer wasn’t all that great I didn’t think. Mostly “meh” to tell the truth. I just figured this would really exemplify the style. It could have been old or something. I didn’t see any type of date marking on the bottle or anything. I mean, the brew wasn’t horrible, but rather just very weak and sub-par in all categories. When comparing this to other German Hefe’s the Pinkus Organic Hefe-Weizen falls way short in my novice opinion. One positive aspect was the fact that it was extremely drinkable. It went down like water, which would be great for the warmer months of the year. So, with that being said give this beverage a try if you have yet to do so and see what you think. You may find it to be excellent. Be sure to leave me a comment and tell me of your opinion if you do.